This spoon commemmorates the time we fought off Sham and the Zardmaster's LepreZards. This spoon will attack with blast of leprechaun-y rainbows, and can even summon the spirit of a LepreZard for extra power! March 26, 2016: The weapon was released. April ? ?, 2016: The weapon became rare. This longbow is a weapon of choice for leprechauns who don't prefer to stomp on you or fire rainbows instead. ^ Is this weapon Melee only or can you switch to Magic too? The Limited-Time Shop doesn't specify. Thanks. Ranged Light Longbow, has a -6 BtH lean, and has no real special. Magic Light Wand, has a normal attack and a 20% proc special, nothing unusual otherwise. I read through this time and didnt see it! Dont bes mads. Bitten by an alien bat this axe can now can draw power from the night/day cycle! It can absorb the energy of our yellow sun for a damage boost during the day [6AM-6PM server time], and become dark and brooding for an accuracy boost during the night. Might be to many 'can's there. This spoon commemorates the Grenwog Festival where we made eveything better by adding dinosaurs. This spoon will attack with a barrage of eggs, and can even summon the spirit of a Grenwog for extra power! It deals -10% damage for having a real special. It takes -5 BtH and deals *85/80 damage. March 25, 2016: The weapon was released. 0 proc Darkness weapon. Click to swap between Melee sword / Ranged polearm+spear / Magic sword. Has +3 BTH lean in Ranged mode. 0 proc, so +9% damage. Click the hilt of the weapon to Eat Fear. This is a Darkness skill that removes Fear from the enemy for damage. Use the numbers below as if it were a bow attack, and then multiply the damage by *[Armour lean]*(1+1.4*0.85*[Fear Duration]*[Fear chance]/[Monster Darkness resist]) for Melee/Ranged, or *[Armour lean]*(0.75 + 1.4*0.85*[Fear Duration]*[Fear chance]/[Monster Darkness resist])/0.75 for Magic. This is treated as a player attack and gets all the appropriate boosts, except that you apply neither (1) the Balance Engine's "weapon attacks do *1/1.1 damage" thing, nor (2) the +9% boost. This mighty weapon can exploit your enemy's nightmares. Tightly grasping the hilt will convert your enemy's fear into extra damage, and you can touch the blade to switch between attacking forms. Why does the weapon's Eat Fear skill have *0.85 like the shield? Is it because it autohits? Also does the "/[Monster Darkness resist]" mean this weapon's skill is fake harm of sorts? Like does it deal negative damage against -ve darkness modifiers? Mimishamarr's currently posted formula says it has a (0.11255*[Hits Connected])% chance to paralyze the monster. That formula would result in the monster being paralyzed a maximum of 22.51 of 10000 tries. I'm pretty confident its supposed to be (11.255*[hits connects])% resulting in a maximum of 22.51%. Thanks to all who help keep the pedia updated. That would make it incorrect, resistance must be accounted for in effects belonging to a weapon with an element and 10000 tries attempted by the player has no bearing on percentages of chance, each hit has the same chance in basic mathematics. The way it is currently written IS wrong, because it falsely states there is a 0.11255% *[hits] chance of paralysis. So with 2 hits, that means a maximum of 0.2251%. The mistake lies in the difference between 'factor' and 'percentage'. The write up of the weapon claims paralysis triggers much lower than 1% of the time, opposed to 22.51%. Except you are quoting somethinscary's own formula instead of the original source, which states (0.11255 *[Monster's Energy Resistance]*[Hits Connected])%. Monster resist being 100 cancels out with percentage leaving decimals being fine when thats left as chance. @Legendary: that's only if the monster's energy resistance is less than 100% if its over 100% the equation is as stated above. Apologies for my first post being unclear on that point. Small update: the *0.85 has been removed. Thanks, poopbum! And I'm siding with somethinscary on this, if my opinion is still valid. 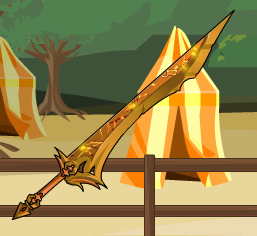 Light Sword, click to swap Melee/Magic. Normal version does -2.5% damage normally, but if fighting a Zard, then the weapon does +10% damage and element seeks. MC/Donation version doesn't have the -2.5% downtrigger and is = in power to the Lv 143 version. A massively powerful light weapon constructed by Zhilo. When it encounters Zard monsters it deals extra damage at the Zard's weakest element. Kae's note: We've basically just added three levels to the Token versions. The MC/Donation version is set to level 153 in case any adventurers would somehow have it, but its sellback is the same as a L150 MC weapon (12102583). 1). Does it mean so? The weapon does -2.5% damage, adjusted to +2.5% damage due to MC(+5% damage). So, the weapon doesn't have a downtrigger. Against zard monsters, the weapon does +10% damage. The weapon does -5% damage, adjusted to +0% damage due to MC(+5% damage). Normally, a penalty for a downtrigger is -5% damage. So, it doesn't have downtrigger due to MC(+5% damage). Otherwise, it's the first one. Or? And, it's 0% proc Light sword. So, +9% damage. Magic Earth Sceptre, +3 BtH lean on normal weapon attacks, MC is the special attempts to inflict Paralyse (allergies, totally), has a 31.51% (adjusted by mob's Earth resist) chance to do so, 50% save, player VStat/LUK vs mob END/LUK. Adds 1 turn to Paralyse if it's already on the monster. As an embodiment of love, a bouquet is the perfect gift to give a mother who must choose between smelling fragrant flowers and living allergy-free. *The pollen has provoked a paralytic allergic reaction in your foe! Melee Earth Sword, the 20% proc special does -10% damage (or the 150% damage is lowered to 135%) but attempts to inflict 3 turns of -8.5 MRM Defence Loss vs Earth attacks (50% save, VStat/LUK vs mob END/LUK). If DefLoss is already active, the penalty isn't applied. When used for their intended purpose, these scissors are used to cut ribbons. 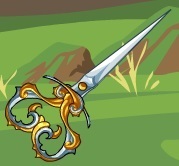 You can also use these scissors to cut your enemy's armor into ribbons, allowing your attacks to connect more often. *The scissors have cut through your foe's defences! Melee Fire Sword, causes player to take +(25/1.4)% damage, but player deals +30% damage with weapon attacks and specials. The +30% is due to the +(25/1.4)% damage taken as well as a +5% damage MC, the Glass Cannon-like effect is basically there as flavour. Melee Wind Sword, no special, MC is on a toggle. You click the handle to swap between Accurate and Powerful mode. Accurate mode has a +4.25 BtH MC as well as a +5 BtH lean, Powerful mode has a +5% damage MC as well as a -5 BtH lean. Reclaim control over the battle. Grasp the handle tow switch between maximum accuracy and maximum power. "Click the weapon's handle to swap to Accurate mode!" "Click the weapon's handle to swap to Powerful mode!" 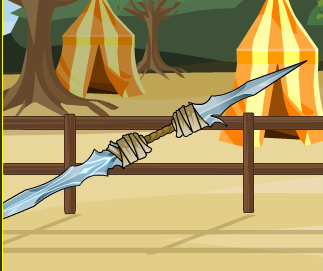 King Thrale's blade exudes the hatred of its prior owner, driving you to attack with reckless abandon. Just to be clear, are weapon attacks the same as player attacks? Ie. Will armour skills that are treated as player attacks be boasted as well? It works on anything that's treated as a normal player attack or weapon special. 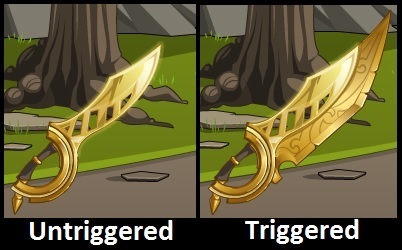 It's treated as a weapon trigger/effect, so it won't be applied to stuff like Chaos Armour skill which don't apply weapon triggers/effects. But, it will be applied to stuff like Human Fisher which do.